Place the okras on a baking dish so that they don't touch and sprinkle the olive oil on them. Use your hands to mix the oil and the okras and separate them once again in the baking dish. Add the salt and pepper evenly. Bake for about 15 minutes. You can serve them with your favorite sauce or simply enjoy them with mayo. I remember the first time I tried okra a few years ago at the first southern restaurant I'd visited. It was steamed and served with tomatoes and onions. Okra's flavor and texture wasn't something I liked all that much and I wasn't too interested in trying it again, but as it's happened with other vegetables, preparing it differently has changed my perspective. This always happens when they're prepared tempura style or when they're dehydrated. Lately I've started to buy vegetable chips that are actually really delicious and a great option for a nutritious snack. 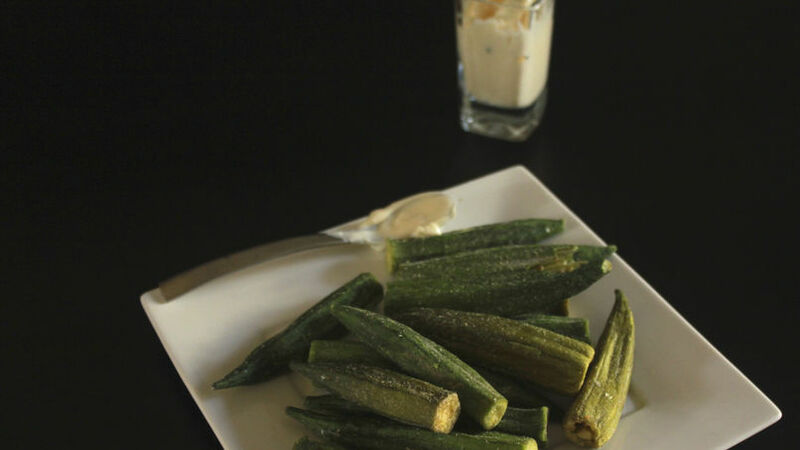 With that in mind, I decided to try them in a different way, one that I knew I would like more, so today I share my okra chips recipe.